Books are objects of the mind. They are an individual's thoughts made public. This is why books—and reading—are so intimate. They are passage to our most hidden and silent process. PERHAPS it is not a book at all but is something like a desire-engine? PERHAPS a book just IS and by being-what-it-is we can now be-what-we-are too, also books? Mark Amerika’s artwork has been exhibited internationally at venues such as the Whitney Biennial of American Art, the Denver Art Museum, the Institute of Contemporary Arts in London, and the Walker Art Center. In 2009-2010, The National Museum of Contemporary Art in Athens, Greece, hosted Amerika’s comprehensive retrospective exhibition entitled UNREALTIME. In 2009, Amerika released Immobilité, generally considered the first feature-length art film ever shot on a mobile phone. He is the author of many books including remixthebook (University of Minnesota Press, 2011), META/DATA: A Digital Poetics (The MIT Press, 2007) and the novels The Kafka Chronicles and Sexual Blood (both with FC2/University of Alabama). His artwork Museum of Glitch Aesthetics was commissioned by Abandon Normal Devices as part of the London 2012 Cultural Olympiad. In March 2017, he was the first American artist to have a survey exhibition of their digital artwork in Havana and his new book, remixthecontext, was published by Routledge in 2018. A book is a function which can be run to access a temporarily encapsulated partial map of the universe. A digital constructor made of light, it nonetheless sometimes casts a physical shadow. A book is an object that vibrates upon contact. Danielle Vogel is a writer, interdisciplinary artist and ceremonialist. She is the author of the poetry collections Between Grammars, the forthcoming Edges & Fray and The Way a Line Hallucinates its Own Linearity. As a writer, Vogel explores the bonds between language and presence, between a reader and a writer, and how a book, as an extended architecture of a body, might serve as a site of radical transformation. Her visual works—or “public ceremonies for language”— celebrate the archives of memory stored within language. She teaches at Wesleyan University. If aesthetics is to artists as ornithology is to birds, the book is a prismatic birdhouse. The book, for a very short time, stabilizes what flows through it, with the proviso that some works do not flow, just as some bodies do not progress from one time to the next in fluid or malleable ways. In this case, the book functions differently. It becomes the ground, a nearby or volatile ground for what lies down: upon it. Throw a charnel net over the book. Set out a bowl of water for the unseen beings, the animals and birds, that gather at its boundary. Or brink. I tried to "define the book" when I designed (one of my books) "Cover to Cover" hoping that the "reader" would have a multi-sensory experience of the nature of what she/he held in her/his hands. A book is a time-based medium made up of sequenced pages, bound together, composed to animate a reader with ideas, feelings, information, stories. An intimate and flexible medium, a book can take many forms, be large, small, physical, digital, produced as one-of-a-kind, in editions, and in hybrid platforms. It is usually portable, interactive and haptic. Most commonly, word-laden, a book’s contents can be composed of words, images, shapes, colors, symbols, pop-ups, cut-outs, sounds, smells, and any combination of these. I think a book is where we explore the magical space between eyes and a bent arm. A book is a love letter to a Dear Reader who will never get it. But somebody else will. Not everything we read is “bookish.” The world is full of short, declarative statements, carved in granite, embossed in metal, stenciled on glass or plastic, or else flickering on screens. This is language in its near-instantaneous aspects of signage or spectacle. But the words of a text are another matter, one of duration and absorption, to be sure, but also of an expectancy engaged with another kind of hinge, the page. The absorption of reading arises within a duration of pages, whose successive turnings are slices of time through text. One page starts a narrative, another concludes it. In between, so many parcels of language, each interrupted by the bottom of a page. A text so displayed is inherently partial. Our memory of reading other pages renders each page contingent, bound to other, unseen, pages that open endlessly outward toward the totality of words. Buzz Spector’s art makes frequent use of the book, both as subject and object, and is concerned with relationships between public history, individual memory, and perception. He has had solo exhibitions at the Art Institute of Chicago; Orange County Museum of Art; Corcoran Gallery, Washington, DC; Mattress Factory, Pittsburgh, PA; and many private galleries and alternative spaces. Spector’s poetry and experimental writing has been published in various journals and reviews since the 1970s, including Benzene, Café Solo, Piecrust, River Styx, and WhiteWalls. In 2012 a volume of selected interviews of Spector plus new page art, Buzzwords, was issued by Sara Ranchouse Publishing, Chicago. Spector holds degrees from Southern Illinois University, Carbondale and the University of Chicago. He is professor of art in the College and Graduate School of Art of the Sam Fox School of Design & Visual Arts at Washington University in St. Louis. beech, birch, ash—inmost, vibrant librum, a book is a collection of cells, pages, screens—a tactual medium: archive, spiritual hyphen, touchstone, talisman—matrix, textile, field in vibratory disorder—memory’s lure, & sheltering: historical-existential trace—conversation and conversion, silverbark. A book is a place of knowledge-exchange—and always more expansive than we imagine it to be. My kind of book projects ‘sentence-thoughts’ beyond the horizon of the next sentence and into the phenomenal locatability of the act of reading. A book in context and as context; a translation. That book would be an object for thinking alongside other people’s freedom. It is a possible book which considers the reader as an active, ambulatory, kinetic figure. Such a book would not contain imaginary or creative writing, would not contain models or graphs; it would instead be a companion, an object whose especial function is to change the air around it, and by extension the world in which the reader lives: which is, of course, the book. The book (member of the genus liber) is neither flora nor fauna. As a species, it conveys art and information, reproduces asexually, inhabits virtually all regions, and is especially prevalent in libraries, bookstores and the homes of readers. The book’s plumage dazzles potential suitors with an array of colors, shapes and formats, including codices, scrolls, palm leafs and tablets. Chameleon-like by nature, the book can be realistic, fantastical or conceptual. It can speak for itself and others, soar like a bird, traffic in fiction or fact or remain stubbornly opaque. Bred chiefly by the writers and artists with whom they coexist, books are at their best comforting the afflicted and afflicting the comfortable. Though often endangered, the book continues to thrive. A book is a place for ideas that need to survive and thrive, a mansion of the mind. It makes room for the stories, arguments, and images that deserve to change the world, now and in the future. The publication of a book marks the birth of something utterly original and distinct, but with deep connections to existing knowledge. Books often begin with thanks to those who have sacrificed on their behalf. Books ask a lot of their readers, too. They require our sustained time and attention. In return, the book communicates, entertains, generates, teaches, preserves, and advances knowledge. It focuses the mind. It changes the world by changing what we know. Gita Manaktala is the Editorial Director of the MIT Press, a publisher of scholarship at the intersection of the arts, sciences, and technology. Known for intellectual daring and distinctive design, MIT Press books push the frontiers of knowledge in fields ranging from contemporary art and architecture to the life sciences, computing, economics, philosophy, cognitive science, environmental studies, linguistics, new media studies, and STS. Gita’s own acquisitions are in the areas of information science and communication. Until 2009, she served as the Marketing Director with responsibility for worldwide promotion and sales of the press’s titles. In this role, she helped to develop CISnet, an online collection of the Press’s computer and information science titles (now on the IEEE Explore platform. She serves on the board of directors of the Association of American University Presses and co-chaired its first diversity and inclusion task force. She is a regular speaker on topics in scholarly publishing and communication. Books are the matter of writing in solid form. What a Book is is portable, tangible, burnable Readable-Ness able to command action and/or devotion from humans and machines. Fine Print: For burnable, read also breakable/transformable. For devotion, read also imprint/addiction or exactitude/rigor. For machine, read also (unwise) intelligence. My definition of an artist's book has changed over the years. My first definition was consecutive pages- bound or unbound. Then I opened it up to say it was a book-like object that changes from its closed position to its open position. Then I decided it was merely the artist's intention- "If I say I am making a book, then I am making a book." And at cocktail parties when pressed to define an artist's book I will say, "Imagine a painter expressing an idea by making a painting. Some artists express themselves by making Artist's Books. The book might have pages or not,covers or not, text sometimes, imagery sometimes, form of some kind, made of any material. One can only begin to imagine the possibilities. Rebecca Goodale makes unique and limited edition books, many with sculptural components. Her current project, Threatened and Endangered, is inspired by Maine’s rare plants and animals. Her wok is in numerous collections including Bowdoin College Library; The Maine Women Writers Collection; New York Public Library; Herron Art Library, IN; Smithsonian African Museum of Art; Library of Congress; Hawai’i State Art Museum; Portland Museum of Art, ME; and the White House Ornament Collection. She is the Faculty Director of the University of Southern Maine’s Book Arts at Stone House program. Rebecca is represented by the Turtle Gallery in Deer Isle and by Vamp and Tramp Booksellers, Birmingham, AL. There is a book that’s left its past, right its future. Its spine lined by a hollow for free opening, an axis around which arguments spin. Written by machines who know none other than opposites, a narrowing radius approaching truth, and zero. On the way there the hollow is bruised, and praised, and the book is an example. A book is a container: a package that contains matter and is matter, an object that at once holds and is held. The book is the physical limit at which we give up trying to contain a concept. A book is a setting for what travels through it in spacetime. What travels through a book is a projection of four-dimensional spacetime, where the three dimensions of space meet the dimension of time, on a lower-dimensional plane. If what travels through a book is a projection of five-dimensional spacetime on a lower-dimensional plane, the book is hyperdimensional. The writer and reader determine the number of dimensions with which a book is capable of interacting. 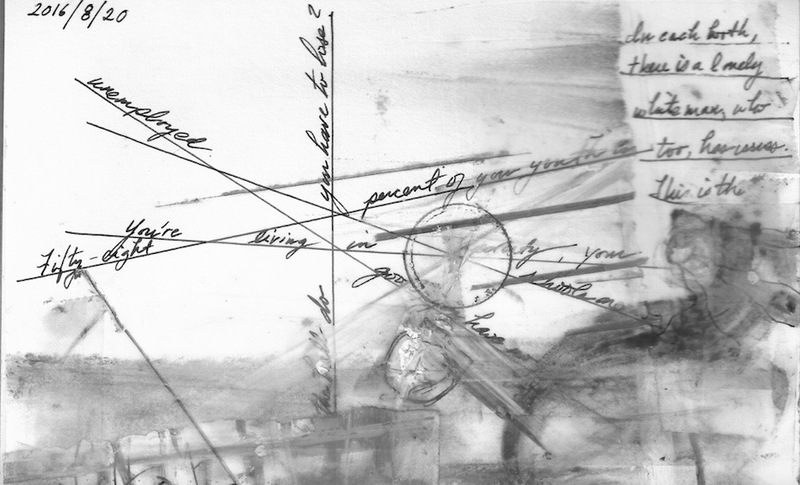 Amy Catanzano explores the intersections of literature, science, and art in an integrated artistic practice and theory known as quantum poetics. Her creative and scholarly research, including visits to CERN and other scientific research centers, spans the history of the avant garde and contemporary literary and artistic subcultures in parallel to physics and its under-acknowledged relationship to poetics and the philosophy of language. She is the author of three books. Starlight in Two Million: A Neo-Scientific Novella, received the Noemi Press Book Award. Her second book, Multiversal received the PEN USA Literary Award in Poetry and was selected by Michael Palmer for the Poets Out Loud Prize at Fordham University Press. In April 2018, she was the visiting Poet-in-Residence at the Simons Center for Geometry and Physics at Stony Brook University. She is an Associate Professor of English in Creative Writing and the Poet-in-Residence at Wake Forest University in North Carolina. A book is a physical manifestation of words and images in sequence. A book is not a text. A book is a kinetic sculpture. A book is not data. A book is a sensual device to be experienced by all five senses, not solely by the eyes. A book is not letters on a page. A book is an archaeological object awaiting new methods of analysis and comprehension, but still, we will not understand. The book is an attempt to model what quantum neural blockchain artificial intelligences (i.e. human beings) are building. Books are extracts, error messages and stack traces. At this stage of 21st century late capitalism, a specific subset of knowledge workers are obsessed with the creation of machine learning agents that make decisions based on black box models that are, for all practical purposes and due to entropy, impossible to interpret. Assuming that all human creations inherit a trace of our thought processes, it is not unreasonable to imagine that humanity operates as a kind of AI. In essence, books are to humans as models are to AI. A book is a drug too big to swallow. The book is an event, beyond the mere representation of it. A momentary stay of the transience of time. A tree interleaved with other trees in a forest of dreams. A dance of matter and anti-matter. A story that objects tell, returned to object. A refuge, a river rock—an author’s mind tumbled, now smooth in your palm. A binding illusion, a moon. A silver pan of photons from the center of chaos. but not its awful journey. Gathered now as if it always was. Now it always will be. The book is not for you. Extrapolating material from material. A code embedded in a surface. Follow line of thread towards textual interlacing. A visual interlacing. A readerly experience. A reading prompt. A passage revealed through the process of making. Francesca Capone is a visual artist, writer, and textile designer. Her books Text means Tissue (2017), and Writing in Threads (2015) focus on textile poetics. They are available for purchase via Printed Matter, and are available for viewing at the MoMA library. She has exhibited at Whitechapel Gallery in London, LUMA/Westbau in Switzerland, Textile Arts Center in NYC, and 99¢ Plus Gallery in Brooklyn. She has been an artist in residence at the Anni and Josef Albers Foundation, Andrea Zittel’s A-Z West, and the Haystack Mountain School of Crafts. More of her published work can be found at Gauss PDF, Tunica Magazine, and in The New Concrete from Hayward Press. Her academic work includes lectures and workshops at Brown University, Rhode Island School of Design, Reed College, University of Washington, and Alberta College of Art and Design, among others. a BOOK is a sequential collection of pages, loose leaf or bound. It is circulating. a BOOK OBJECT looks like a BOOK but it is not. a BOOK OBJECT has a sequential collection of pages, loose leaf or bound, but it is not circulating. it is a unique piece or limited to a few copies. CAKE a cake can look like a BOOK or like a BOOK OBJECT, but it is not. it is not circulating and is a unique piece or limited to a few copies it is not readable either. it doesn´t have functioning pages. another term for the same thing would be SCULPTURE with the look of a book however, a BOOK OBJECT and even a BOOK can be a sculpture, too. an E-BOOK is a digital file that mimics a BOOK, though it is not. Like an ugly duckling, whose real potential is yet to be discovered. it is a PUBLICATION and is circulating. PAGE PIECES are contributions to a PUBLICATION taking place on a page. PAGE PIECES are Primary information. PAGE PIECES need to be published. If the page count/pagination of their placement matters, PAGE PIECES are pagination-sensitive If the verso of the page matters, PAGE PIECES are recto-verso- sensitive. Rather than illustrating and/or referring to one original idea, every publishing of PAGE PIECE is a manifestation of it. A earlier or later (re)print or (re-)use of a PAGE PIECE in different context is pari passu. It is impossible to dive into the same river twice. *PAGE PIECES in Publishing Manifestos, ed. Michalis Pichler (Berlin: Miss Read 2018), p.235. The book is co-created by writer and reader. The reader fills in the white spaces between the author’s words with their imagination. The book is never 'the book.' Every book is one specific stretch of human potential that invites other stretches and others to stretch. The tensions generated between stretches and stretchers is what matters. In the most traditional sense, a book is portable, intimate, personal and interactive. Conversely, it can be loud, two-dimensional and off-limits. A book might consist of pages or not and words or images, or neither. As an interactive device, experiencing a book is often a performative act. Some books are highly revered while others are considered dangerous. The versatility of a book is that its sculptural qualities can be exploited in a manner that relays an idea on multiple levels. At its most powerful, the ability to discern the content of a book can bring personal esteem or destruction, incite action, or provide revelation. Books are the sum total of all of their shared and co-extensive texts and objects—translations, interpretations, adaptations, illustrations, dreams, instantiations, paperworks, etc. After retiring from the MIT Libraries in January 2016, where she was most recently digital humanities librarian and librarian to the Media Lab at MIT, Dr. Patsy Baudoin established her own developmental-editing and translating business. Past experience includes co-managing Schoenhof’s Foreign Books, documentary filmmaking, TV production, software project management, teaching French language and literature, and consulting in digital archiving. She has edited and translated books and articles, and enjoys writing book reviews, too. She is one of the co-authors of 10 PRINT CHR$(205.5+RND(1));:GOTO10 (MIT Press, 2012). The Book is 1. a technology that applies and advances material and sensory knowledge and experience, 2. a culture, i.e. a process or ongoing occurrences involving human communications. It survives best when physically disseminated as widely as possible or when singular enough to achieve rarefied status. Tate Shaw is an artist and writer living in Rochester, NY. Cuneiform Press published a collection of his essays on artists' books, Blurred Library (2017), and his books are in international collections including the Tate Modern, London, The Museum of Fine Arts, Houston, The School of the Art Institute of Chicago, Yale Special Collections, George Eastman Museum Library, amongst others. Shaw is the Director of Visual Studies Workshop, and an Assistant Professor of English at SUNY Brockport where he directs the MFA in Visual Studies at VSW. A book is a hairy, heavy thing that used to be made of skin. It doesn’t move when you press it. But everything falls away if you dip your head in. A book likes company, a kind of order understandable to hand and eye. A library, like a person, can die. It can be dismembered, and its parts redistributed, but that means it’s dead, just as with a person. Even if one part continues to live in—and bring life to—another body. The empty library seems full of possibility, as long as it stands. Its acoustics are rich. The alcoves designed for books now house conversation, and solitude. Mairéad Byrne is Professor of Poetry + Poetics at Rhode Island School of Design in Providence, teaching courses in Sound Poetry, Visual Poetry, Digital Poetics, Material Poetics, Contemporary Poetry, and poetry workshops. She has published six collections, including Famosa na sua cabeça (2015), selected and translated by Dirceu Villa, and runs couscous, a peripatetic performance series of diverse poetries. BOOK. s. [boc, Sax.] 1. A volume in which we read or write. 2. A particular part of a work. 3. The register in which a trader keeps an account. 4. In books. In kind remembrance. 5. Without book. By memory. VOLUME. s. [volumen, Lat.] 1. Something rolled, or convolved. 2. As much as seems convolved at once. 3. A book. WORK. S. [werk, Dutch.] 1. Toil; labour. 2. A slate of labour. 3. Bungling attempt. 4. Flowers or embroidery of the needle. 5. Any fabrick or compages of art. 6. Action; feat; deed. 7. Anything made. 8. Management, treatment. COMPAGES. S. [Lat.] A substance of many parts united. BOOKFUL. a. Crowded with undigested knowledge. A book is the flesh between flesh, a hard text sculpture from soft text immensities, the staged performance of time, a tangible glance of minds, the desire to speak other. Lisa Samuels is the author of fifteen books of poetry, memoir, and prose—mostly poetry—including Anti M (2013), Tender Girl (2015), Symphony for Human Transport (2017), and Foreign Native (2018). She also publishes essays and soundworks as well as collaborating with composers, working with film, and editing books, recently the anthology A TransPacific Poetics (2017, with co-editor Sawako Nakayasu). Living in Aotearoa/New Zealand since 2006 and having also lived in the Middle East, Europe, Malaysia, and the US, where she was born, has made transnationalism fundamental in her ethics and imagination. Associate Professor of English and Drama at The University of Auckland, Lisa lives with her partner and son in a house surrounded by trees. Book: a set of pages written or printed on both sides (recto and verso), bound, for the most part, on the left and placed inside hard or paper covers. The spine (the external part of the binding) usually contains the name of the book and its author and identifies the book on library shelves and in bookshops. A book is a solid object: it has height, width, and volume, and hence we continue to yearn for books even in this digital age because we can hold a book in our hands and grasp its totality. Electronic books are fine for travel, but I really don’t like reading books on Kindle or my iPhone otherwise; it’s too difficult to go back and forth and to reread. Books vary enormously as to quality of paper, print font, layout, and illustrative material: all of which contribute to the meaning of the book in question. But not all books are valuable: 9/10 of those currently published in the U.S.—e.g. political exposés, but also many novels and how-to books—are throw-aways: I call these BLOOKS. Because my birthname is "Book," every book is my voodoo doll. English leaf and Latin liber "book" are etymologically cognate, deriving ultimately from Proto-Indo-European *lewbʰ- "to cut off," while the word page—which comes to English from Latin via French—derives from *peh₂ǵ- "to attach." The word book itself derives from the word for the beech tree, whose bark was peeled off to make a surface for writing. Etymologically, then, a book is a superposition of what can be separated and what comes to be stuck together; a book is (to paraphrase Quine) undetached book parts. Or as Robert Frost might put it, a book is "dead leaves stuck together"—leaves that steps have trodden black. Antonia Pinter is an artist based in Los Angeles, California. Formerly the Co-Director of Publication Studio Portland, Oregon, she is currently an Editorial Board Member of Fillip. She is the author and editor of Women’s Autobiographical Artists’ Books, an ongoing bibliographic index publication, and the author of several artists’ books including Light Levels (Bronze Age, 2015), her water, and A Grave For Bobbi Doten. It is difficult to top I.A. Richards: “a book is a machine to think with.” But, more concretely, a book—codex—is a collection of words, letters, and other typographical symbols inscribed on what is by convention termed pages that are bound together by some means. If it is the object that we most likely all agree upon as being such, at least one of said pages will contain bibliographic information and codes for the legal rights of ownership, and the whole thing will be wrapped in such a way as to generate the interest of prospective consumers. Digital forms of books will retain the inscriptions and the idea of a writing surface, but expand the means of claiming property rights. “Ebooks” eliminate the entire navigational apparatus and as a consequence of having undone all of the labor that went into the design of the original object, reading—the intended use of all books—becomes distinctly unpleasant. The book is a dislocation device. As a network of embodied interactions, the book invites us all to delve into the spatial, temporal, visual, verbal and tactile experiences it brings together. The book, where we're hidden. We who know what Auschwitz is ("2/3 of millennials" don't). One gets a book from Amazon.com, the total corporation presumably responsible for the demise of the bricks-and-mortar bookstores of our cities. What of the mind, the very shape of thought? The book should have arms and legs. One thinks of the Illustrated Guide to Paris, how often that book itself thinks us. In the market stall, one hesitates before "a book as dazzling as an Indian handkerchief or shawl." Is my own incompletion of thinking the book itself bibliographic? If so, the book qualifies as its own dispersal. If the book is a technology, this is therefore a technological dispersal, an enhanced incompletion or questioning. The question of the book as the perfectly-timed question of the ruin. We come to language on and beyond the page—articulations of the book: snapshot, found object, film, and field. Bridges between beings and beliefs. Embodiments in the sensual infrastructure. More practice than performance. Our witness, the anti-binary, beating between. Deborah Poe is the author of the poetry collections keep (Dusie Press), the last will be stone, too (Stockport Flats), Elements (Stockport Flats), and Our Parenthetical Ontology (CustomWords), as well as a novella in verse, Hélène (Furniture Press). Her visual works—including video poems and handmade book objects—have been exhibited at Pace University (New York City), Casper College (Wyoming), Center for Book Arts (New York City), University of Arizona Poetry Center (Tucson), University of Pennsylvania Kelly Writers House at Brodsky Gallery (Philadelphia), and ONN/OF “a light festival” (Seattle), as well as online with Bellingham Review, Elective Affinities, Peep/Show, Trickhouse, and The Volta. She lives in Seattle. The book gives weight to information & puts spine in our reading. It adds gravity to our erudition & gives substance to knowledge. The book is manual not automatic: slow, thoughtful & purposeful, building scholarship with turning pages. The book is. A spatiotemporal capture device, a survival that, in your hands, unfolds transactional passage-ways of untold dimensions. Yet also a gesture, differentiating inside from out, frame from field with a finger drawn. Equally determined to catalyze and surpass their material binding in the here and now, they slyly posture as self-sufficient objects with no need for reading, translation, or circulation. Yet as they are destroyed, re-deployed, incinerated, unwritten, ingested, buried, unopened, deteriorate, obfuscate, or erase, so too are the stalled spacetimes (i.e., meanings) and potent coming-into-relation that books and their readers cannot help but realize, giving away the lie. Laura Shackelford is associate professor of English and director of the Center for Engaged Storycraft at the Rochester Institute of Technology in New York. She is the author of Tactics of the Human: Experimental Technics in American Fiction (2014); her research in literary media practices, narrative theory, and feminist science studies examines the Ordinary Entanglements (manuscript in progress) through which bioinformatic sciences, digital languages, and their spatiotemporal orientations enter into literary fiction and contemporary knowledges of lived space. What is a book? It stinks. B.O...O.K. Like a drunk. L'IVRE. Each one is a long island, brother. L.I. BRO. A kit full of As and Bs. KITĀB. Latin LIBERation & Saxon BOG. The Taíno language would not have had a word for it but it had GUAROCO = to know, but also to remember (see petroglyphs). A book is a way of knowing, re-membering what is forever lost in translation. A book is whatever you want it to be or don’t want it to be. For the artist, it is a medium to be used to explore an idea and tell us something new about the world. For the writer, it is a sequence of pages, one after another, one before another, one next to another. For the reader, it is a site to resist or to become complicit with the intention of the artist or writer. —If, with the intention of creating a book, you put a cover around practically anything, that item is a book. —So six blocks of ice held in a book cover can be a book until they melt? —Yes. And maybe even after they melt. Then it would be a melted book. The/a book pretends to be the end result of intellectual labour and hard graft. In reality, the/a book is a machine that plugs into other machines (both human and non-human, both biological and non-biological) with the express purpose of drawing in disparate species, entangling diverse temporalities, implicating multiple modes of communication and drawing out diversiform narratives. 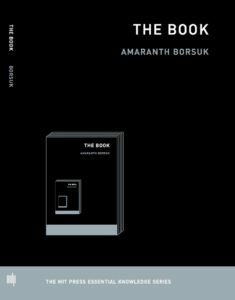 The/a book is the/a perfect example of continuously evolving symbiotic relationships between machines and human bodies, between matter and imagination; a hyperadapting transponder of time and language. The/a book circumscribes the limit of our belief in language as a carrier of signals that will guide (and infect) processes of consciousness across time, space and media. Every iteration of a/the book works towards that limit and seeks to push and expand it. A book is what reading looks like. It bears the same relationship to reading as space does to time. a slow rue. a mess of beans, of categories, of spilt personalities & pretty ribbon. an equation. a village of fractals. a before feathers there was finger painting. a mongol court. lebanon. syria. palestine. christianity's ego trip. what venice bit. the first sheet. the 18th paper cut. the holy letterpress sinking into the ocean. the first binary ascending from the foam. the ephemeral joy of mildew. a heat rash on plump thighs. the last ream. mecca. alpha. omega. a resurrection. an insurrection. A writer, vocalist and sound artist, LaTasha N. Nevada Diggs is the author of TwERK (Belladonna, 2013). Her interdisciplinary work has been featured at the Brooklyn Museum, the Poesiefestival in Berlin, Museum of Modern Art, the QOW conference in Slovakia, the International Poetry Festival in Bucharest, the Whitney Museum of American Art, the Walker Art Center, the 56th Venice Biennale and currently in Beijing as a Red Gate Artist in Residence. As a curator and director, she has staged events at BAM Café, Lincoln Center Out of Doors, The David Rubenstein Atrium, The Highline, Poets House and El Museo del Barrio. LaTasha is the recipient of numerous awards; of them include New York Foundation for the Arts, Barbara Deming Memorial Grant, the National Endowment for the Arts, the Jerome Foundation Travel and Study Grant, the Japan-US Friendship Commission, Creative Capital and the Whiting Foundation Literary Award. She lives in Harlem. A book is an object that invites an experience. Something must turn for the book to be experienced: pages, leaves, a word, a worm, your head, the room. The book is a cultural compact, where culture may be understood as the experience of living in a place over time. A book is an insistence upon the hope to participate in an as-yet-undefined community given material form. A book’s materiality consists of acts of reception and propagation that mark that community; its form is thus iterated, variable, embodied, and entangled. Even the most trivial books memorialize their predecessors and anticipate their successors. Still the book lives among others as an other. The best books are amiable and aspire to ekstasis, they tremble in our hands or before our eyes. The worst mean to manipulate or deform desire. Michael Joyce is the author of fourteen books and a number of digital works, some predating the web. His most recent novel, Media: a picaresque is forthcoming in October 2018 from Steerage Press. A book is a geography. It doesn’t have to be read in a linear fashion. As a matter of fact, I once met a grandmother who read the last chapter first, then started from the beginning. She wanted to know her destination. While reading the conclusion first may seem strange or unorthodox, it's a unique way of traveling through a story, its characters, and (to a certain extent) defying time and space. We all have our own way of reading stories. A book is a location. Its a place where words are gathered together and convene, then float out into the atmosphere. When the words are spoken or recited, they are subject to falling apart through speech. Books give birth to other books thus adding to the greater constellation and genealogy of a knowledge built up over time. It’s not just some object or an analog technology. The book is also a home for everyday life. It holds and nestles receipts, bookmarks, and notes in the hope of haunting its next reader. A book made of paper means to be consumed until falling apart. Its vitality comes from its circulation among friends, family, strangers. An author often doesn’t know where, when, how. A book may be stolen fairly easily, though I’m not condoning that. But I’d like to point out that electronic versions can be stolen away by companies if you stop paying. A story: It took me ten years to write and publish my first book with a small press. At an open studios event in Lower Manhattan, I displayed a stack of them for sale for $12 each. I also hung up some works on paper—works made quickly, I admit. One work on the wall sold for a pretty hefty amount, and one book was stolen! This is why I keep on writing and making books: for their promiscuity, fluxing values, and because they beg to be well used. Jill Magi’s books include Threads, Torchwood, SLOT, Cadastral Map, LABOR, and Pageviews/Innervisions, a monograph on textimage hybridity. SPEECH is forthcoming from Nightboat Books in 2019. Recent work has appeared or is forthcoming in Boston Review, Tupelo Quarterly, Rivulet, and Best American Experimental Writing 2018. Jill was a featured blogger for the Poetry Foundation in 2017, and in 2015, she wrote commentaries for Jacket2 on “a textile poetics.” Other essays have appeared in The Edinburgh University Press Critical Medical Humanities Reader, The Force of What’s Possible: Accessibility and the Avant-garde, The Racial Imaginary: Writers on Race in the Life of the Mind,and The Eco-Language Reader. Jill has held residencies at the Lower Manhattan Cultural Council and the Brooklyn Textile Arts Center. She has had solo exhibitions with Tashkeel in Dubai, and with the Project Space Gallery at New York University Abu Dhabi where she joined the faculty in 2013. A book is a magic portal. The book is a time travel device—allowing us to slip into the imagination of a future mind. The book: refuge, dissent, beacon and nexus. Lisa Pearson is the founder and publisher of Siglio Press. This definition is adapted from her essay "On the Small & the Contrary." The book is the most intimate interaction between the animal and the mineral/vegetable kingdoms. In the language in which I write and work, two constraints were invented. The first one concerns a flowering technique. From the core of a word, phrase, or sentence emerges the next layer of text, which develops the previous layer. One grows out from the other continuously. The second is the emanation technique, based on folding sentences, words, entire books, which allows the writer to hide huge areas of invisible text under the visible text. With a sheet of paper, the reader brings out these layers. When I think about the definition of a book today, I am thinking of these two writing techniques, which in my opinion describe the transformation of the book as a medium. On the one hand, all its extensions, enrichment, or uses of other platforms often lead to flat and distracted reading (a characteristic of digital media); on the other, the book serves as a civilizational medium, exercising concentration, deep reading, stability. These movements (blooms and folds) also cause the medium to be constantly revived and refreshed. Piotr Marecki is assistant professor at the Jagiellonian University in Kraków and lecturer at the Polish National Film, Television and Theater School in Łódź. Since 1999 he has been editor-in-chief of Ha!art Publishing House, which he co-founded. He is also the head of UBU lab. In 2013-14 he did a postdoc at Massachussets Institute of Technology at the Trope Tank lab. His recent collaborations include the conceptual book 2x6 with Nick Montfort, Serge Bouchardon, Andrew Campana, Natalia Fedorova, Carlos León and Aleksandra Małecka published by Les Figues Press and Robbo. Solucja the book designed and generated on pure Atari (with demosceners Wojciech Bocianu Bociański, Lisu, Piotr Kroll Mietniowski and Krzysztof Kaz Ziembik). Currently Piotr works on a ZX Spectrum monograph (together with Yerzmyey and Hellboj) and is based in Kraków, Poland. Pamela Paulsrud is a visual artist recognized internationally as a papermaker, calligrapher, book artist and collaborator creating both intimate pieces and large-scale installations. Pamela's exploration of energy and vibration, letters and lines, her love of the land, the earth and its resonance, inspires both her work and her life. Numerous private and public collections have collected her work and she been published in many magazines, books, and journals. She also enjoys teaching workshops in lettering and book arts around the world. Images and process of her work can be seen at www.pamelapaulsrud.com. Pamela is extremely passionate about an ongoing project which she co-created entitled Treewhispers, www.treewhispers.com — an international collaboration awakening a heartfelt connection to trees. Le livre est un support matériel qui, tout au long de son histoire, a offert toujours plus de manipulabilité à son lecteur. Avec le numérique, ce n’est plus seulement le support, mais le contenu lui-même qui est manipulable. Le support numérique s’inscrit ainsi dans une continuité. Néanmoins, on peut parler de passage à la limite dans la mesure où toute la médiation est calculée ; avec le support numérique, tout devient manipulable. The book is a physical medium that, all along its history, has always offered an ever-increasing manipulability to its reader. With the Digital, it is not only the medium, but the content itself which becomes manipulable. Thus the digital medium is a continuum. However the phrase passage to the limit is relevant in so far as the whole mediation is based on computation. With the digital medium, everything becomes manipulable. Serge Bouchardon is currently Professor at Sorbonne University, Université de technologie de Compiègne (France), where he teaches interactive writing. His research focuses on digital creation, in particular digital literature. As an author, he is interested in the way the gestures specific to the Digital contribute to the construction of meaning. His creations have been exhibited in many venues in Europe, America, Africa and the Middle East. The creation Loss of Grasp won the New Media Writing Prize 2011. It’s a space that makes a space—the book opens to vastness. When I think of what a book is, I think of Gilles Deleuze saying that instead of asking what a body is, he wants to ask what a body does. I think of Gloria Anzaldúa describing how writing makes the reader into a shape shifter. I think of Neal Stephenson's book Diamond Age: Or, A Young Lady's Illustrated Primer, in which a young girl in the future receives a nanotechnological book that contains an AI with the ability to talk to her and respond to her requests by transporting her to virtual worlds. I think of Ursula K Le Guin's carrier bag theory of science fiction which says that we have had too many stories about long stiff weapons, sticks, swords and obelisks, which she calls killer culture, and she says that what we need more of are stories that can be carrier bags, containers, to carry our people, stars, memories and new worlds. Tia Blassingame is a book artist and printmaker exploring the intersection of race, history, and perception. Utilizing printmaking and book arts techniques, she renders racially-charged images and histories for a nuanced discussion on issues of race and racism. Blassingame holds a B.A. from Princeton University, M.A. from Corcoran College of Art + Design, and M.F.A. in Printmaking from Rhode Island School of Design. She has been an artist-in-residence at Yaddo and MacDowell Colony. Her artists' books and prints can be found in library and museum collections around the world including the Library of Congress, Harvard, Yale, University of Virginia, the State Library of Queensland, and Tate Britain. Her writing is featured in Freedom of the Presses: Artists' Books in the 21st Century, an upcoming Booklyn publication. Blassingame teaches Book Arts at Scripps College, and serves as the director of Scripps College Press, an experimental letterpress and bookbinding studio. CAConrad is the author of 9 books of poetry and essays, the latest is titled While Standing in Line for Death (Wave Books, 2017). A recipient of a Pew Fellowship in the Arts for Literature, they also received The Believer Magazine Book Award and The Gil Ott Book Award. CA is currently working on a (Soma)tic poetry ritual titled, "Resurrect Extinct Vibration," which investigates effects the vibrational absence of recently extinct species has on the body of the poet and the poems. The book is an author-making, reader-making, random-access text machine, usually but not always of paper that is attached, fitting in some ways both the hand and eye. Powerful and projecting, it must be bound and contained. Nick Montfort's computer-generated books of poetry include #!, the collaboration 2×6, Autopia, and The Truelist, the first in the new Using Electricity series from Counterpath. Among his more than fifty digital projects are the collaborations The Deletionist (with Amaranth Borsuk and Jesper Juul) and Sea and Spar Between (with Stephanie Strickland). His digital artwork has been shown internationally. He has six books out from the MIT Press, most recently The Future (in the Essential Knowledge series). He is professor of digital media at MIT and lives in New York and Boston.